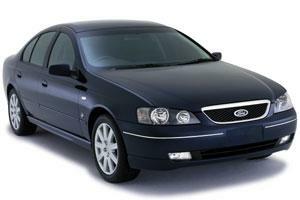 The BA 'Barra' Ford Falcon range was officially released on September 30 2002 as a major facelift of the AU Series. 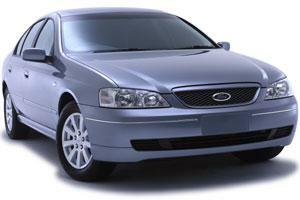 The BA Fairlane/LTD range was released in July 2003 to replace the AU. 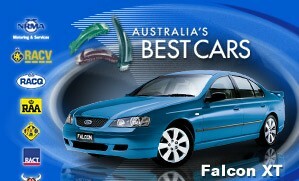 Falcon- $33,640-$54,980. 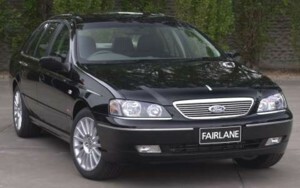 Fairlane- $50,990-$54,490. 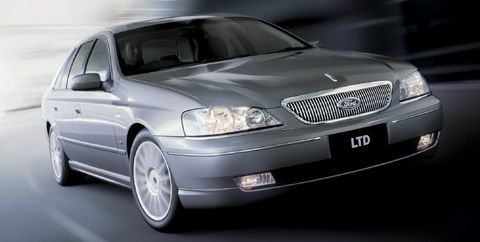 LTD- $64,820-$68,000. 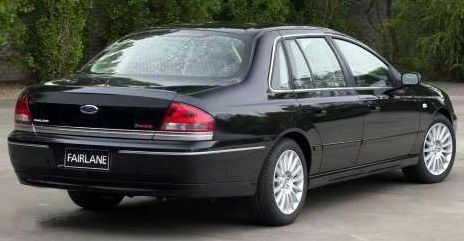 The BA model was replaced by the BA MkII in October 2004. 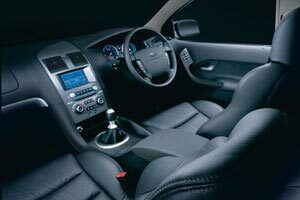 Ford Performance Vehicles, a joint venture between Ford and Prodrive, replaced FTE (Ford Tickford Experience). 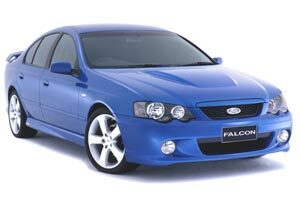 The BA FPV Falcon range released March 2003. 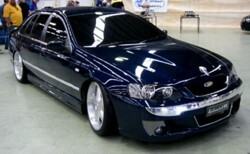 GT, 5.4L, V8, Sedan, 290kW @ 5500rpm, 520Nm @ 4500rpm. 0-100km/h- 5.92sec 0-400m- 14.29sec. GT-P, 5.4L, V8, Sedan, 290kW, 520Nm. 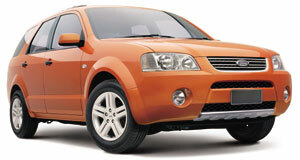 Pursuit, 5.4L, V8, Utility, 290kW, 520Nm. 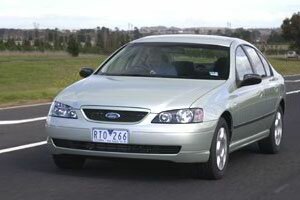 BA Ford Falcons are used as Police, Fire, Ambulance, and Traffic Authority vehicles. They are also used as Taxi's. Still 4-0 litres, still cast iron block, now four valves per cylinder (up from 2v) and double overhead camshafts with VCT variable camshaft timing on both the inlet and exhaust side. A dual length intake manifold and modifications to the alloy cylinder head allowed the rev limit to be raised from 5700rpm to 6000rpm. Ford claims noise, vibration, harshness reductions along with a stronger, broader torque spread, particularly in low to middling revs. The new six-cylinder engine is six percent more fuel efficient than the old one, but that there's no fuel economy gains once in the car - which suggests the new BA Falcon is slightly heavier than AU. E-gas: Dedicated LPG engine is based in the twin-cam inline six, with higher compression ratio, revised induction system, and powertrain control module mods. Power is 156kW, torque is 372Nm. 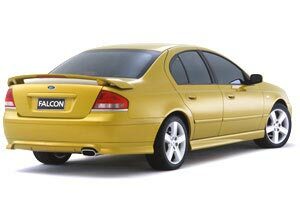 Falcon will be the first vehicle in the Ford world to use the 5.4-litre V8, built in the Windsor plant in Canada. The block is cast iron, with alloy cylinder heads, again with VCT acting on a single camshaft per bank, and 3 valves per cylinder. 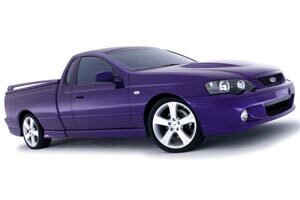 The inlet and exhaust manifolds are designed specifically for Australia. 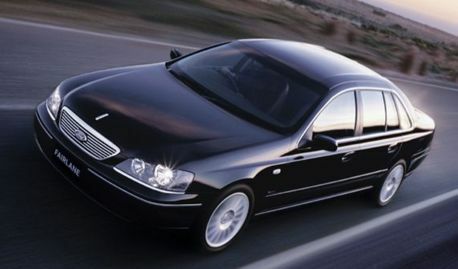 This engine is optional on XT, Futura, Fairmont and Fairmont Ghia models. This engine will be unique to the XR6, and is basically the inline six with a Garrett GT40 ball bearing turbocharger mounted on a stainless steel exhaust manifold, and intercooler. Same cast iron engine block, same alloy cylinder heads with stronger valves and different VCT calibration. Pistons and rings upgraded, fuel pressure increased. Ford recommends premium unleaded for the turbo six. 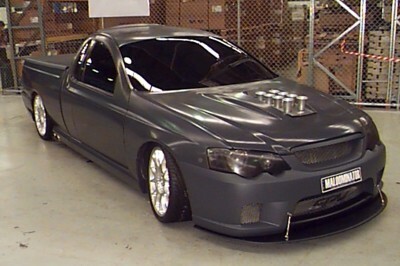 The big daddy of the Falcon range, this baby's headed for the XR8 and will form the basis of the FPV engine. 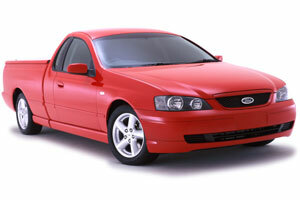 Based on an 'off the shelf' engine from the 'States, Ford Australia modified it extensively for local application. High flow cylinder heads, Mustang Cobra R manifold and inlet camshaft, 4 valves per cylinder, quad cam. 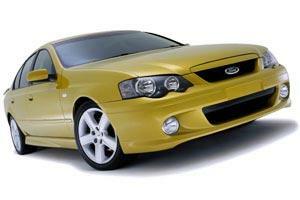 Ford has many racing teams, racing the BA Falcon in the V8 Supercars with its introduction into the category in 2003. 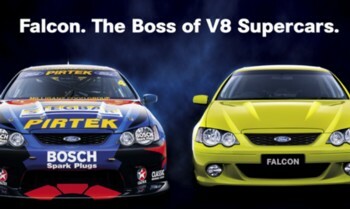 Ford and the newly formed FPV introduced a new factory racing team in the V8 Supercar series, racing 3 Falcons for 2003. Drivers include #5 Glenn Seton (Ford Credit), #6 Craig Lowndes (CAT), and #19 / #7 David Besnard (FPV). 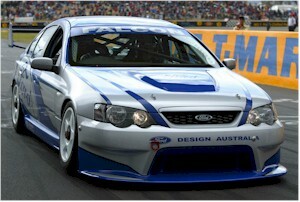 2003 Ford Performance Racing BA Falcons. Ford also has interests in the Stone Brothers Racing Team. The team had 2 BA Falcons for 2003. Drivers include #4 Marcos Ambrose (Pirtek), and #9 Russell Ingall (Caltex Havoline). For the 2003 Season of the V8 Supercar Championship Series, Marcos Ambrose won the V8 supercar title. 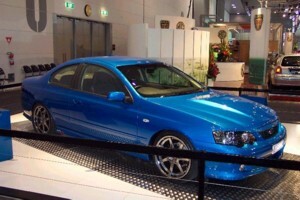 For the 2004 season of the V8 Supercar Championship, SBR managed to get a 1-2 in the championship. #1 Marcos Ambrose (Pirtek) came 1st, with team mate #9 Russel Ingall (Caltex Havoline) coming 2nd in the championship. 2003 Championship winning BA SBR Falcon of #4 Marcos Ambrose. Ambrose. 2nd in championship #9 Russell Ingall. Ford Territory in pre production form (Melb. 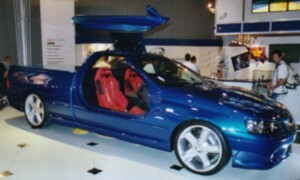 Motor Show Mar '03) A Falcon based AWD Crossover vehicle.